There’s nothing more terrifying than an emergency – especially one that costs you a fortune. Life doesn’t always go exactly as planned. Building an emergency fund is a perfect way to be prepared for whatever life may throw at you. According to Investopedia, emergency funds help you “improve financial security by creating a safety net of funds that can be used to meet emergency expenses as well as reduce the need to use high interest debt, such as credit cards, as a last resort.” As young people, starting your emergency fund as soon as possible will help pad yourself financially against future unexpected expenses. Such expenses can stem from the loss of a job, illness, a car accident, and more. The general rule of thumb is to save three-to-six months worth of your income. However, this can vary depending on a number of factors. For example, during the economic recession, many experts recommended keeping nine months to one year’s worth of income on hand. That's because jobs were sparse. How much you save will depend on a dollar amount that makes you comfortable. If you have dependents, you may require more emergency dollars than someone who does not. The reliability of your vehicle, home, and other daily essentials may also impact just how much you should keep on hand. There's no universal answer. The first step you should take when starting an emergency fund is laying out your monthly expenses in a month where they are highest and basing the amount you save on that number. A little at a time. When looking at three-to-six months worth of your income, the number can be pretty daunting. Where do you even start? Well, you start small. 10% of your paycheck doesn’t look like much, but it will add up over time. Choose an amount that’s reasonable based on your current expenses and begin putting that money away. Earn extra cash. There are several ways you can earn extra money. You can try getting a second job. (I work as a weekend receptionist at a nursing home on top of my regular full-time job.) You can drive for Uber or Lyft. You could even try babysitting. 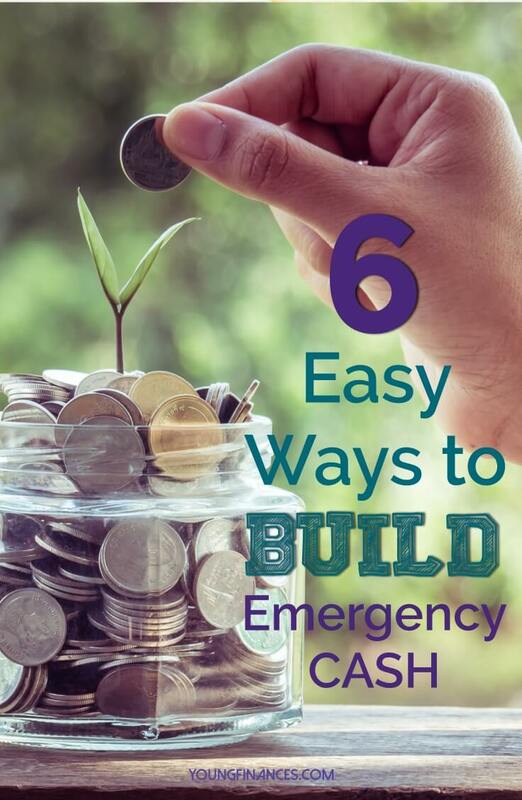 Find ways to get a little extra cash and put that towards your emergency fund. Cut a habit. Do you buy Starbucks every morning? Eat out every night? Cut that out! That bi-weekly nail appointment? How about doing your nails at home? That money would go really nicely in your emergency fund, trust me. And you’ll begin to see it grow faster than you realize. Sell your old stuff. I’m a big fan of Plato’s Closet. It’s a quick easy way to get rid of old clothes and shoes and (hopefully) get a little bit of cash. You can also try selling items on Craigslist, such as old furniture or electronics. Once you cash in on your crap (yes, I just called it crap because you probably don’t need it or use it anymore), you can put that money straight into your emergency fund. Choose the right account type. When setting up your emergency fund, it’s worth doing your research into the type of account that is best for you. High interest savings accounts will help you save while earning a little bit of interest… and who doesn’t love free money? Set it up automatically. Automatic deposits to your account of choice will make the saving feel, well, automatic. Being automatic means you won't need to make a conscious effort to save. How great does that sound? Experts agree that an emergency fund is a financial necessity. Yet a significant number of Americans do not have one. With these easy tips, you should be able to start building your fund right away. When it comes to saving, every little bit counts. Small change here and there can build up over time. Small cuts in your spending can build up over time. But, in this day and age, everything is automated or monitored online. While the saving resources made available by the advent of the Internet are vast and extremely helpful, what about the ways we used to save before online banking? I was recently inspired to get creative in the ways that I save money… in addition to all those excellent online tools! Plus, having multiple ways that you save money can’t hurt. I was inspired to find new ways to save by a heavy wallet full of coins. I rarely used cash in purchases, let alone coins. So I thought, why not start a coin jar? When I was a kid, we had a huge coin jar to which the family contributed change. When the jar was full, we cashed it in and went on a vacation. I hope to do the same with my coins now. Basically, having the intent to save your change can add up over time to allow you to travel, make a big purchase or do something for yourself you’ve always wanted to do. Part of the automation of banking is credit and debit cards giving you constant access to your money. While this is great, it can also lead to excessive spending. Back in the day, if you didn’t have enough cash on you, you couldn’t spend. Installing a weekly cash budget, and therefore restricting your credit and debit card usage, will cut unnecessary spending and ultimately open up more of your income for savings. But how do you get people to come? Nowadays, there are so many ways to get the word out about your garage sale: social media, Craigslist, word of mouth, etc. Check information about your neighborhood, some will have a designated weekend for a neighborhood garage sale. You’ll have people lining up before you know it. Back in the day, if you wanted to save money, you hid it under your mattress. Or in a box under your bed. Or in a sock drawer. While I’m not suggesting you do this, the concept is still valid. Set aside a small amount of cash each week into an envelope or box that you keep in a safe place. Over time, those small amounts will become a big amount. Use that money for emergencies or a special treat to yourself. Another great way to limit your spending, and ultimately increase your savings, is to apply the “So Many Days” Rule to your luxury purchases. After a special purchase, shopping spree, new electronics, expensive dinner, etc., designate a certain number of days (e.x. 30 days) that you must wait before another special purchase. By giving yourself a measurable amount of time to follow, you can limit the big ticket items and put more money into savings. It’s hard to remember how people kept track of their money before things like online banking and ATMs. But the old times may be on to something! As clever, creative ways to save money, the above options are great inspiration. However, remember: these ideas are meant to complement a significant savings strategy, not supplement it. You should always have a bigger plan in place, but the little bits do count – literally! Eventually, you may need to start paying student loans. Or a cell phone bill. Or a car payment and insurance. Or maybe you want to take that international vacation you’ve always dreamed of. Whatever it may be, and whether you acknowledge this now or not, you have to change your behavior now to create more financially responsible habits in the future. The first step to more responsible finances is budgeting. You probably know you need to create a budget for yourself, but are stuck on where to start. First and foremost, you need to determine where your money is being spent. A smart way to do this is by categorizing your expenses into two groups, essential expenses and discretionary expenses. Rent, insurance, car payments, utilities, bills, loans. Any one of these can be considered your essential expenses. Often described as “needs” versus “wants,” these are the expenses essential to basic living functions and survival. Pretty self-explanatory. However, be honest about which expenses you consider essential. A shopping spree every month or bar tabs will likely not fall under this category. As you can imagine, discretionary expenses are basically… everything else. Anything not required for living. Alcohol, non-essential clothes shopping, vacations, movie tickets, salon visits, whatever it may be for you. Once you’ve categorized your expenses, you can begin budgeting. Analyze your expenses and determine where you can spend less. Set restrictions for yourself and stick to them. I read somewhere once that budgeting can be like a diet – you set out with good intentions, but after a few weeks you begin to stray from your plan. Don’t let that happen o you. If you follow your budget, you should now have some extra money in the bank. Can you guess what you should do? Complete the second step to responsible finances: Save it. Standards for saving vary based on the person you’re talking to, but I’ve always believed that you should have 3-6 months living expenses in your savings. In the event of an emergency, or unpredicted event such as job loss, you need to have a plan. At the end of each month, put away the money you saved by reducing spending through your budget. No doubt about it, budgeting takes a lot of self-discipline. Building a budget, sticking to it, and tracking it frequently all are a challenge. But hopefully these tips and tricks will help you get over the initial hurdle of creating your budget so you can move on to better responsible financial habits. Do you have any tips for new budgeters?